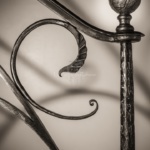 All the wrought iron handrails we make are unique. 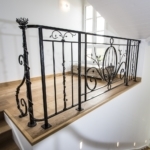 We do not have a standard model, as we prefer to create a personalized handrail for each client, adapted to their tastes, desires, and surroundings. 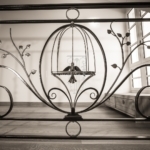 Stop on each of the achievements or scroll down and discover some of our most remarkable wrought iron railings. 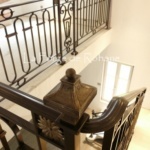 A steel and wrought iron tree that served as a ramp and handrail to climb this challenging staircase. 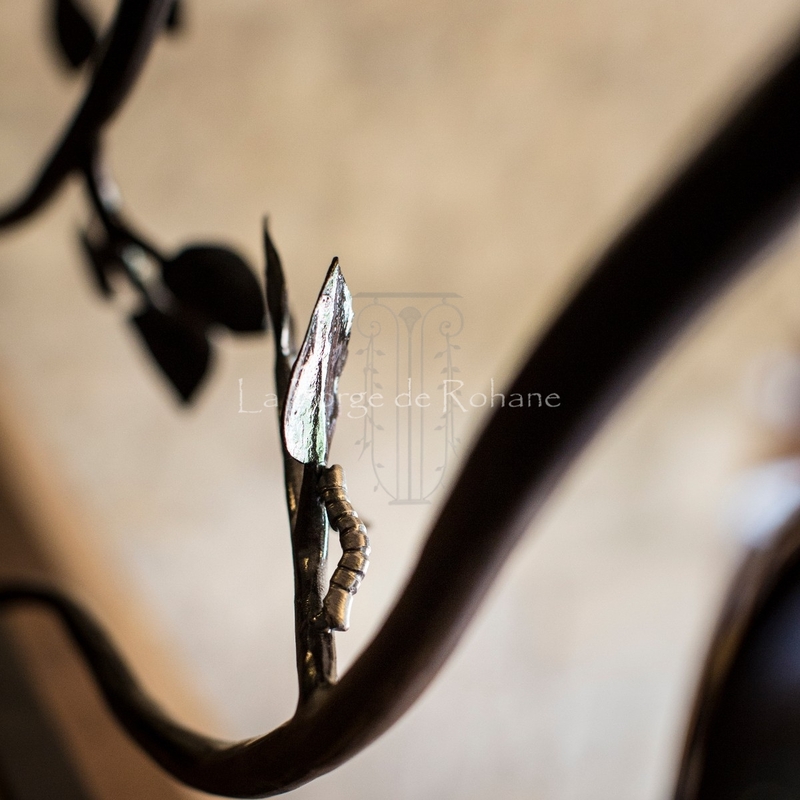 Wrought iron, lacquer and patina steel finish. 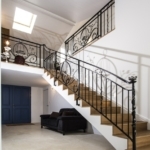 Installed on a stone staircase on a Saracen vault, this handrail is very inspired by the Art Deco period. Under the staircase, we decided with the customer to create a glass wall in the same spirit, rather than closing it by a low wall, integrating coloured glasses and forged decoration. 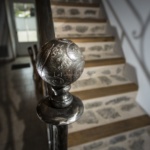 Spotlights were installed along the steps of the stairs and under the stairs to enhance the whole piece. 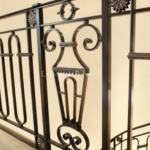 A wrought iron railing strongly inspired by the Art Deco period. Its simple lines allow it to fit perfectly into any type of interior. The beginning of the handrail is forged. 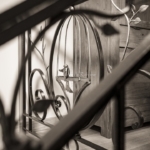 Steel structure and wrought iron. Lacquer and patina steel finish. Seeing as this type of project is uncommon, it deserves a little more attention! The creation of this project required more than 300 hours of workshop work, excluding the hours put in for reflection and production. The “Tree” part, is self-explanatory. 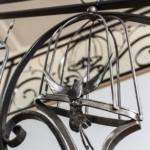 The “Nature” part, results in the creation of various decorative (and forged) elements, like a bird’s nest with its eggs, a spider’s web watched by an attentive lizard, processionary caterpillars, posed birds on a branch or taking flight… In short, a little story of life! As for the leaves, we made almost 250, forged one by one! 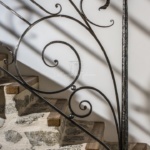 Neo-rustic style wrought iron stair railing? 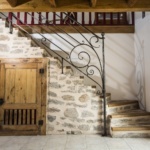 This wrought iron railing was installed in a gite in the Deux-Sèvrienne countryside. 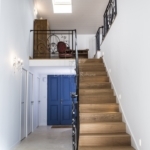 The design had to fit in with the essence of the house, without imposing a defined style. So we juggled past, present and future, while remaining simple and, I hope, elegant… Maybe we can call it “Neo-Rustic” style? The ball on the starting pole is engraved and aged. The length of everything, the handrail and guardrail of the mezzanine, is approximately 18 linear meters. 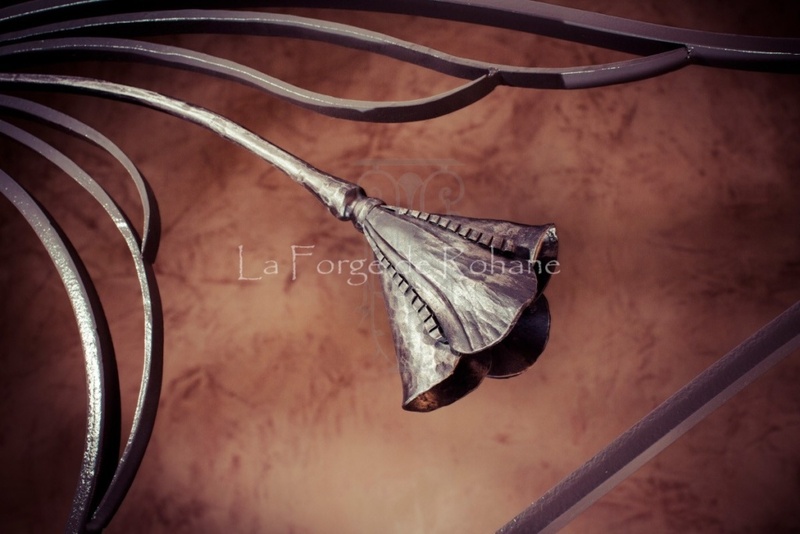 We forged about 180 leaves for this project. 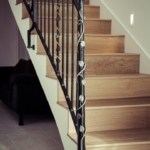 Contemporary and simple, a finely wrought decoration is at the centre of each length of the guard railings. The bars are made with 14mm round iron. We only forged a few bars to “energise” the whole piece. Painted and weathered steel finish (for forged elements). This handrail, with the mezzanine guard railing, is assembled without welding, it is done by riveting and screwing elements between them. 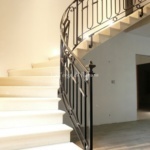 Inspired by eighteenth century models, this handrail was placed in a new, contemporary house. 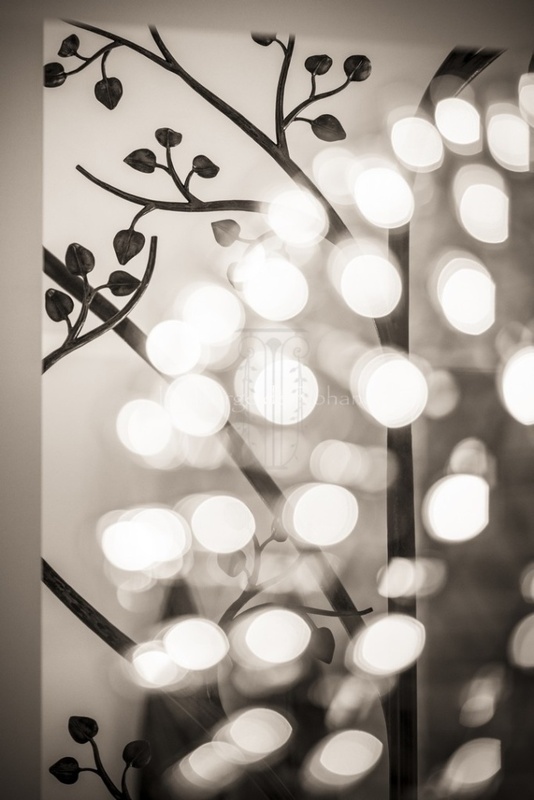 40 corrugated iron rosettes were made, which required more than 60 hours of work.